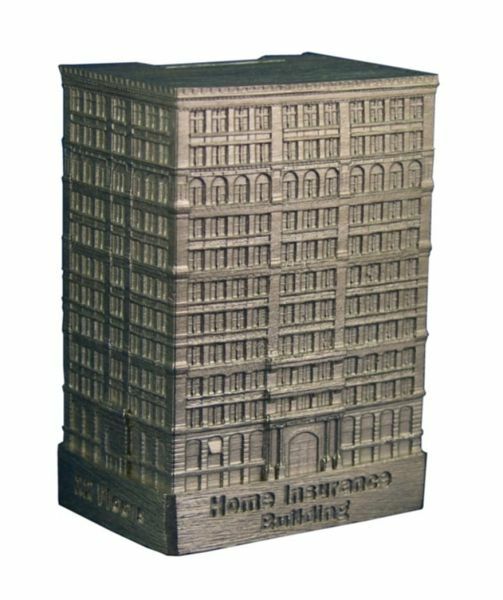 The Home Insurance Building is located at LaSalle & Adams Streets in Chicago and was completed in 1885. This building was designed by William LeBaron Jenney and stood 180 feet tall with 12 floors. Considered by most to be the first skyscraper, the Home Insurance Building of Chicago was originally built in 1885 as a 10-story building, 138 feet high. In 1890 two more floors were built on top raising the height to 180 feet. Sadly it was demolished in 1931 to make way for the Field Building (now the LaSalle Bank Building). This pewter replica stands 2-3/4" tall at 1" = 75 feet. Shown in new pewter.